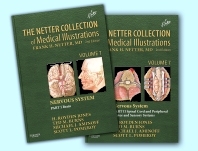 The Netter Collection of Medical Illustrations: Nervous System, 2nd Edition provides a highly visual guide to the brain, spinal cord, and peripheral motor and sensory systems. These two spectacularly illustrated volumes in the masterwork known as the (CIBA) Netter "Green Books" have been expanded and revised by Drs. H. Royden Jones, Jr., Ted M. Burns, Michael J. Aminoff, and Scott L. Pomeroy to mirror the many exciting advances in medicine and imaging - offering rich insights into neuroanatomy, neurophysiology, and the broad clinical spectrum of neurological diseases and disorders. Get complete, integrated visual guidance on the nervous system with thorough, richly illustrated coverage of neuroanatomy and physiology.